The double shopping cart seat cover features fun and stylish designs that protect your little ones from whatever may have been left on that grocery cart seat! Machine washable, these make a great gift! Explosive Experiments are packed full of experiments you can do at home. Based on Scholastic's best-selling Horrible Science books, this kit make experiments fun! Launch a rocket, erupt a volcano, make a lava lamp - and more! Recommended for young scientist age 5+. The family collage photo frame is a great way to display your favorite pictures. Perfect for any room in the home or at the office, this makes a great Father's Day present or Christmas present for Dad! Old McDonald had a farm - and put it in a floor puzzle for hours of fun. Extra large 2' x 3' puzzles with pieces that are shaped like animals! 20% Off Two or More T-Shirts! 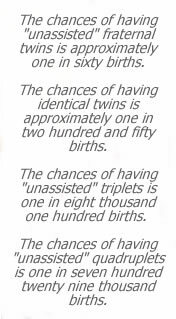 Father of Twins, Twice the Dad says it all. After all, it takes someone very special to be a dad and that goes double for dads of twins. This fun dad shirt makes a great gift, no matter how old his twins are! Flappy the Seal is an adorable wooden toy perfect for toddlers. Based on the classic pull toys, Flappy includes electronic sounds and music. This Folding Trampoline is 100% fun, and ASTM Safety Approved, too! The Folding Trampoline encourages kids to exercise - but they'd never know it! The easy grip handle makes this Trampoline safer for kids than many floor models.